Gloss Tyre Dressing in 4 Litre Container For Hard-Working Detailers! When detailing a car, the overall look is not truly finished until each surface has been washed and protected. 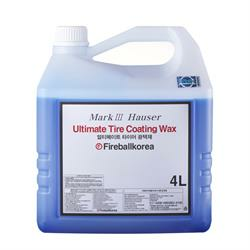 Fireball Ultimate Tyre Coating (Blue) provides a gloss finish that repels dirt and water for a long-lasting shine. The new larger, four-litre container is perfect for busy detailers who like to buy in bulk! Economical, 4L size, perfect for busy detailers!